I always thought that people who weren’t native to a place didn’t really identify with it – that if you asked somebody where they were from, they’d name their hometown. I grew up in the DC area, so whenever someone asked where I was from, I’d always say “here” – this has always been my home, and I can’t consider myself “from” anywhere else. I’m a Washingtonian because I’ve always been one. So I assumed that DC was “my city” and that people who moved here didn’t necessarily feel that they were Washingtonians. Until I started reading We Love DC, and realized that even transplants love this town and feel a connection to it. People who like to move from city to city may not identify with DC, but anyone who makes their home here is a Washingtonian. And I love that what those tourists are coming to see is part of my daily landscape. Not everybody in Los Angeles drives past Disneyland every day, but as part of my commute I drive past the White House, the Washington Monument, the Jefferson and Lincoln Memorials, and the United States Capitol (I used to drive past the Pentagon, too). I’ve been driving this route for years now, and I am totally serious when I say that these landmarks touch me every time I see them. I love it when out-of-towners come to DC to protest, too. Sometimes it causes traffic delays, but I’m okay with that because it’s part of the joy of living here. DC is home base for protests and rallies of every stripe, and it’s precisely because of the unique political nature of the city. Nobody holds a “March on Chicago” when they have an important cause – they come here. This is where you can capture the nation’s attention, this is where you can make a difference. DC is about effecting change, we are ground zero for making your world better. We’re also ground zero for honoring people. I love the lead-up to Memorial Day weekend, when motorcycles start appearing on our highways and streets. I have absolutely nothing in common with the people who come to remember our POWs and MIAs, but I love when Rolling Thunder comes to town – they have a conviction, a sense of duty, and they bring it to DC every year. And despite the fuss over the Tom Hanks-endorsed WWII memorial changing the landscape of the National Mall, we find room to honor everyone. The Air Force memorial might be just across the Potomac, but it’s still part of the celebration of men and women who have done something for America. There’s so much to love about DC: I love the Truth Truck, the Easter Egg Roll on the White House Lawn, the motorcades, the swarms of students in matching shirts, the cabs in every color of the rainbow, Braddock’s Rock, the Old Stone House, the Canal House, the friezes on EPA-East, softball games on the west end of the Mall, and that a little panda could melt the heart of everyone. And I love how we’re growing. 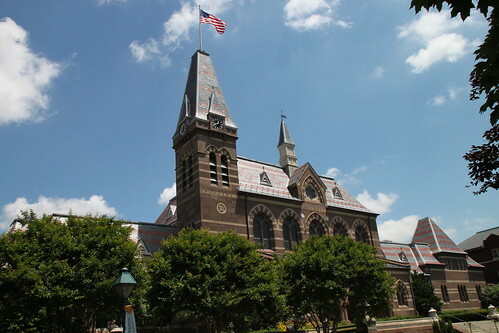 I’m a student at Gallaudet University, which is adjacent to Trinidad and just north of the Atlas District. I curse the construction on H Street every time my car hits another steel plate, but the H Street Trolley is going to make a big difference to a neighborhood that’s been struggling nonstop since the 1968 riots. Eastern Market is growing too: it’s better than ever after the renovations following the fire in 2007. When friends from elsewhere mock the District, I tell them not to make fun of my city, my hometown. I got especially defensive when I saw the New York Times write about our nightlife, saying it had “finally come of age” – as if my city was only about politics and didn’t know how to have a good time! But when it comes down to it, it’s not my city, it’s America’s city. A recent study says DC is the fourth most liberal city in the nation, but by nature we have conservatives and liberals here. We’re everybody, and that’s why I love DC. Want to share why you love DC? Tell us in Suggest-a-Story.